Review the results of important legislation and the impact of our united advocacy efforts. 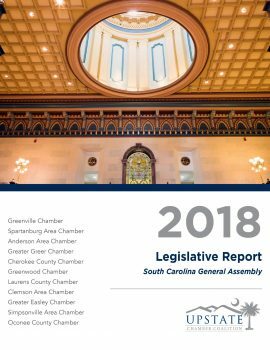 As the 2017-2018 legislative session began, the Upstate Chamber Coalition set out an ambitious policy agenda, and we knew it could take several years to achieve. Instead, we achieved many of our top priorities over this two-year session, and these successes will allow businesses of all sizes to continue to expand and power our region’s booming economy for years to come. We’re proud to say that our two top priorities — the road funding legislation last year and the workforce expansion legislation this year — are now law. Thank you for your advocacy! Read more about what we achieved below.